Salt printing is one of the oldest photographic printing processes and is a predecessor of the traditional black and white photography. The process was invented around 1835 by the British scientist and photographer Henry Fox Talbot. Until around 1860 it was the most commonly used method to print photographs. The salt print derives it’s name from the fact that the paper is made light sensitive by using (among other chemicals) ordinary table salt. In this workshop you will learn how to make your own salt prints based on your own work (digital files). This workshop is accessible for people with little experience with photographic processing. This one-day, hands-on workshop will introduce you to one of the earliest ways of creating an image with light. Cyanotype is a photographic printing process that produces a cyan-blue print. It uses relatively safe chemicals making this process accessible even for people who have little experience with photographic chemistry. 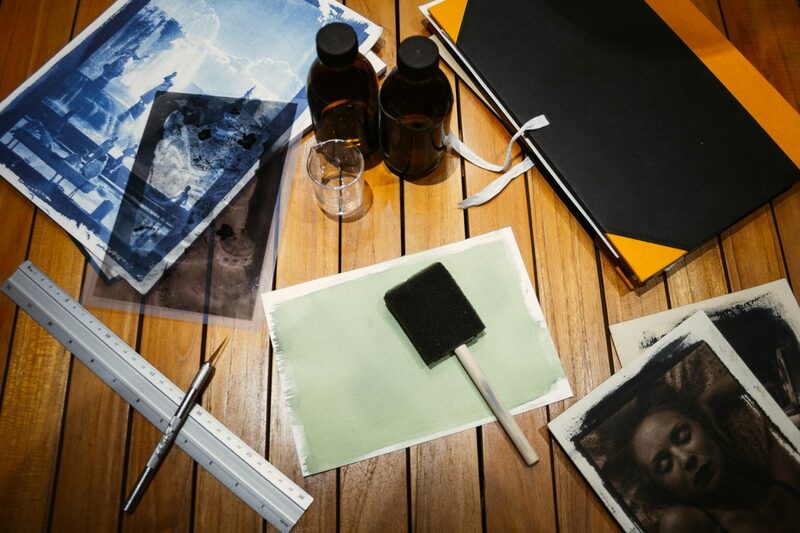 This intensive workshop will give you a thorough grounding in making cyanotype prints of your own work, and the chance to experiment on different types of paper. The wet-collodion process is early photographic technique invented in 1851. It involves adding soluble iodide and/or bromide to a solution of collodion and coating a glass plate with the mixture. The plate is then immersed in a solution of silver nitrate to form light sensitive silver salts. The plate, while still wet, is exposed in the camera. Immediate processing of the exposed plate is then necessary because, after the collodion film had dried, it becomes waterproof and the developing solution can no longer penetrate it. While difficult to master and labor intensive, the process is valued and practiced to this day for the level of detail and clarity it allows. This full-day workshop covers the basics of the wetplate process. Some previous knowledge about darkroom processes is highly recommended for this workshop. All workshops are organized by Art Chapel please visit their website for more details about locations/dates or if you want to sign up.